homemade paint can pinhole camera, paper negative, 20 second exposure, negtive scanned and post-processed in Photoshop, including adding the color, and the "WarmSun" texture from Kim Klassen's texture collections Thanks, Kim! This is a historic ranch within the boundaries of Chiricahua National Monument in southeastern Arizona USA. 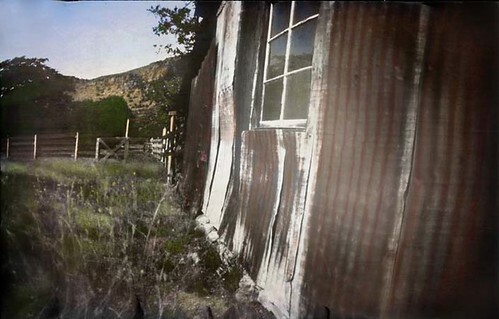 The Erickson Family homesteaded here around 1887, and the second generation operated the outfit as a guest ranch. The early days of homesteading were dangerous for the Ericksons, as conflict with the Chiricahua Apaches were still common. This building is one of the barns on the ranch. It was an extremely bright day, and the sun was shining right on the sheet metal building. It was a quick exposure, even for the ISO speed of 6 of the paper negative! image made September, 2010, re-processed with color April, 2011. Oh my....a handmade pinhole camera??? You are one ambitious photographer! The result is beautiful, too. wow, you had to work for this photo! it was worth it, i love the feel of it! I'm in a phase ( a long phase) of my photographic life where I enjoy s-l-o-w-i-n-g down the process of making a picture. It gives me great satisfaction to finish each one. Hi Kristy -- it's very interesting, what you're doing! It has a very nice effect.